Gilet and Booties, (Items I keep ... Cool toned leopard topper? Unsolicited advice: If you're preparing to edit for a move, your first questions should concern space (for storage), climate, and lifestyle. Will you have less or more space to store your things? Is it the same climate or a new one? Is your lifestyle about to change significantly, e.g. retirement, new job, new baby? It's difficult to do, but try to think in terms of future needs vs. what you've been wearing now -- at least if any of these factors are going to differ. In my case, I was going to have more storage space in the new house -- but difficulty transporting everything, since mine may be a temporary relocation and we had to take most everything in suitcases on a plane vs in a moving van/ trunks. I moved to a more temperate, moderate, but much more rainy climate. My lifestyle is going to be very similar. Work from home, teaching, presentations, a lot of walking. 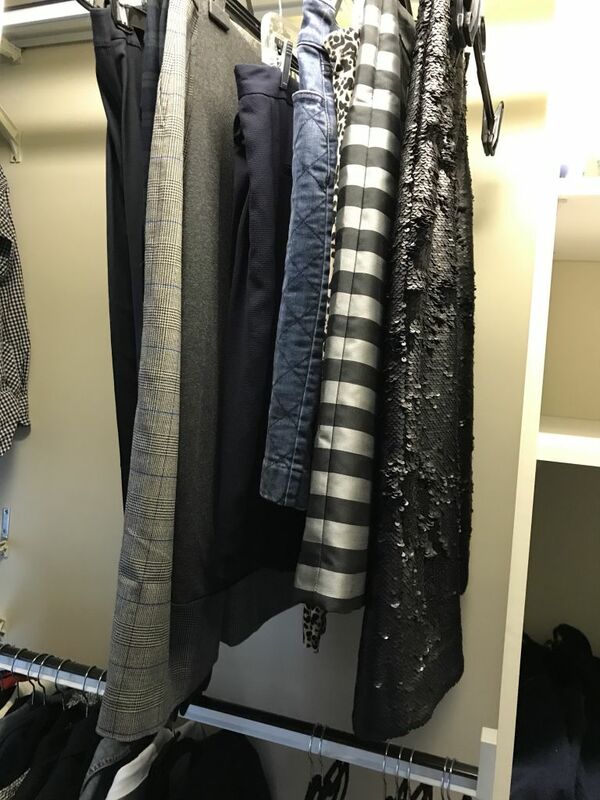 I left some items back in a "holding zone" at my old home -- my big parkas (these can be retrieved if necessary), some heavy winter boots, certain sweaters. I'm not counting those as edited out -- but they're not part of the active wardrobe, either. Items that just didn't work after putting them through their paces, e.g. they were experiments that in the end didn't feel like "me," they fit okay but never felt right, didn't work in my outfits, etc. Overall, I average about 40-60 "retired" items per year. Which is around 1/3 of the wardrobe. I guess you can look at this two ways. It's a lot of wardrobe churn...or not. Because most items I retire have 3-5 years of wear at minimum, which means that unless they're special occasion pieces they typically meet that arbitrary 30 wear threshold. As you can see, I do make mistakes. Interestingly, my mistakes tend to be for "essentials" vs. statement items. Yes, I buy the odd statement that does not work out -- but more often I buy essentials (like turtlenecks) in the expectation I'll get a ton of wear from them, but for some reason they fail to work out as I had imagined or hoped, either due to quality, fit, or something else. ETA: After examining for wear and fit, my main question is: does this item make me happy? Does it help me make good outfits or do I always feel "off" in it. If I tend to feel "off" in something, I'm pretty ruthless, however much it cost me. It's a sunk cost anyway, just sitting in the closet. Out, out, out with it, I say!! 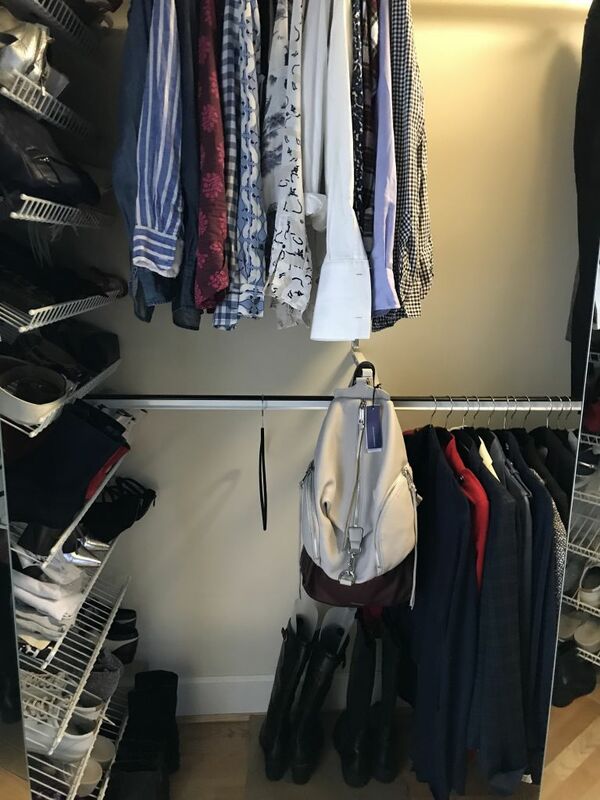 Here are pics of my new closet. We have a massive amount of storage space here but it is oddly laid out. No drawers, so I bought some baskets/ boxes and am making do. I find in my new climate I still put a few things away seasonally (the last photo here -- I've boxed very lightweight items and put them in the guest room). But much more of my clothing is potentially usable across seasons. 3. Shoes/ booties/ sandals (I have some boots and my coats in the hall closet downstairs). 6. 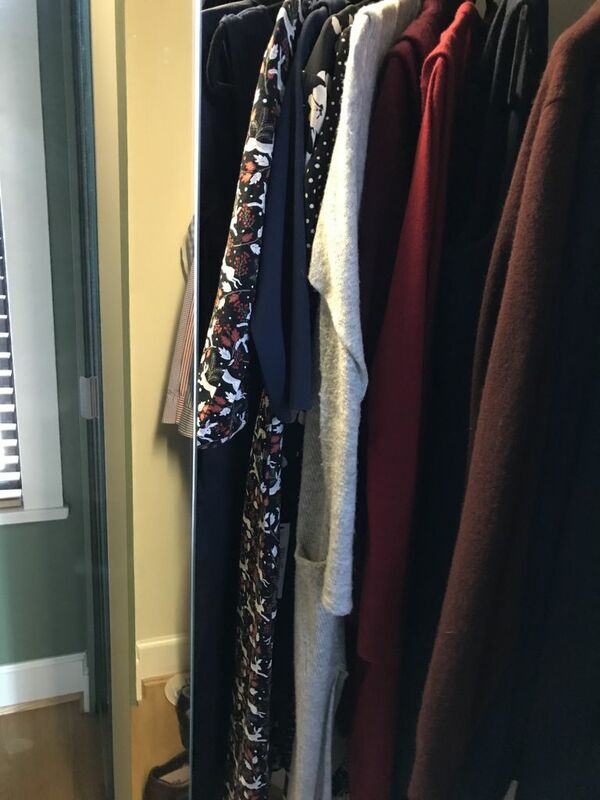 Dresses & long toppers (in another part of closet where Mr. Suz keeps his stuff, but it's the only full length area and I need room for midis. 7. Undies and socks in baskets. 8. Scarves, gym stuff, etc. Phew! That's a long recap. If anyone has questions, let me know! GREAT post, Suz. Thank you for sharing. It is quite helpful to me. Interesting . Your 1/3 turnover rate is intriguing - just as a measure in itself . Getting 3-5 years wear out of something seems reasonable to me . Odd to not have a dresser for things ....and I spot a new RM backpack ...;) I sold mine here on the forum a couple of years ago . Mine was black . Is this hanging with tags on for consideration still ? Thanks, Suz. Makes perfect sense. What a pleasure to have plenty of storage space. It's important to understand why items aren't working, which can require some soul searching. You did that. Interestingly, I'd have brought ALL my wardrobe with me for the move. We did that when we temporarily moved to France for a few years before coming to Seattle (and were living in South Africa at the time). I just assumed you would do that too! Never assume, right! We sent it all over snail mail with a service - that which we couldn't bring in suitcases. So we had EVERY wardrobe item with us, and I'm glad we did despite the change in climate (South Africa - Europe - US). I have NEVER once so far regretted letting go of my own items either. High five. I do regret letting go of some of my late Mum's '60s and '70s wardrobe though. I think I'd have worn that today. Sentimental vintage. I also make purchasing mistakes. You don't know whether something will really work untill you've put it through its paces. But I don't beat myself up about it because it seldom happens, relatively speaking. I don't expect every item to be a wardrobe workhorse when you have a moderate or large wardrobe. I relax into the process and don't stress about it. Hope that makes sense. This has been very interesting so thank you for making the effort for doing it at a time when you are really busy.l can’t contemplate losing a third of my wardrobe,does that mean that you regularly buy that amount of clothes to replace the ones that you ve edited?Do you do what Angie does and buy a seasons refresh in A/W and S/S and then step away from the shops?I hope that these questions aren’t too personal,please feel free to ignore if you don’t want to answer them. as i'm reading this i've realized that my current condo is the longest i've lived anywhere as an adult...i used to move every 3 years or so...and used to hate to pack so a lot of stuff got passed on to save me the trouble....i changed climates just once...i moved from New England to Norht Carolina i had 2 bathing suits and 4 pairs of winter boots, yeah, that didn't work! anyway, great recap, and i'm impressed at how organized you seem to be. Thanks for the edit examples and reasoning. And enjoy your new location. So envious of your storage. Even without drawers you seem to have a wonderful set-up. As I do my own edit, I plan to keep in mind your statement, "I have never regretted letting go of something" which is something I too can say, but have trouble remembering. And even if there was the occasional regret (your gaucho pants) it's always better (for me anyway) to have less stuff. Barbara Diane, thank you. I *am* enjoying the new location! I also tend to shop in two big sessions for F/W (NAS and early October) -- only making other F/W purchases to replace essentials that wear out mid-season or sometimes to refresh knitwear at sales in January. I usually do a single shop in the spring/summer, in May/ June. Though sometimes I get my footwear earlier, in March. I then stop shopping, looking, or doing anything other than wearing my clothes. Angie, what you say makes perfect sense. It is easier not to stress of course when the financial situation is relatively comfortable and also once you feel comfortable with your own style. I don't stress much anymore either. But I used to, when I had less money. Now I just chalk it up to experience and try to learn what I can from it. No one can possibly predict all variables so there are bound to be some losers. But on the other side, "not knowing" is also what makes for surprise workhorses and especially wild card workhorses. And don't we all love those?!! I didn't leave too much of the wardrobe in Kingston. And if we knew our move was permanent I'd have brought everything. I only left the really heavy winter stuff (parkas, boots, a few heavy base layers and sweaters) and a few infrequently worn but still beloved items in a holding zone. Lisa, you have a good eye. More on the backpack soon! My 3-5 years is similar to Jenn's, I think. Her wardrobe is smaller but we have a similar approach and similar wear rates for our clothing -- I needed more because of the more varied climate I used to live in. Sterling, I'm glad if it helps! I'll be interested to hear your thoughts. Suz, this is interesting and immensely helpful! Thank you! Wonderful post! Your closet looks beautiful. With our most recent move, we have more useable closet space than I’ve had in 20 years. I’ve actually been enjoying the process of reorganizing, and figuring out how to use the new space, as you’re clearly doing. Suz, you are absolutely right. It's easier to relax into it when you're more financially comfortable and solid about your style. Makes sense what you left behind too. I would love to have a large closet like that. Wow! We moved cross country 30 years ago. We were brutal in culling our things. We paid for the move ourselves, so everything we owned was evaluated. Was it worth paying $0.50 per pound to keep it? Mostly we got rid of big heavy items, but also a lot of clothes, and also books. :( We had a huge garage sale and nearly everything sold. Even sweaters with holes in them. That really surprised me. Interesting to hear about what you got rid of, and how long you hang onto things. I think my purging-to-buy ratio is about the same as yours. I also hang onto things for about the same amount of time—maybe a little less long because I cycle through things a bit quicker. I’d say we’re both doing a good job! I too find that essentials are where I make my mistakes. They usually end up not fitting quite right, or being slightly the wrong colour, pattern or texture. This is a master class level of analysis! Your categories make sense and I’m impressed that you categorized each item. I especially like that you included how many seasons you’ve had each item. I’m not sure how many items I’d have for each of your categories but I do know I want more items in the worn out category and less in the others. Really well thought out and inspiring. How fun to have more space and a more temperate climate to play in! 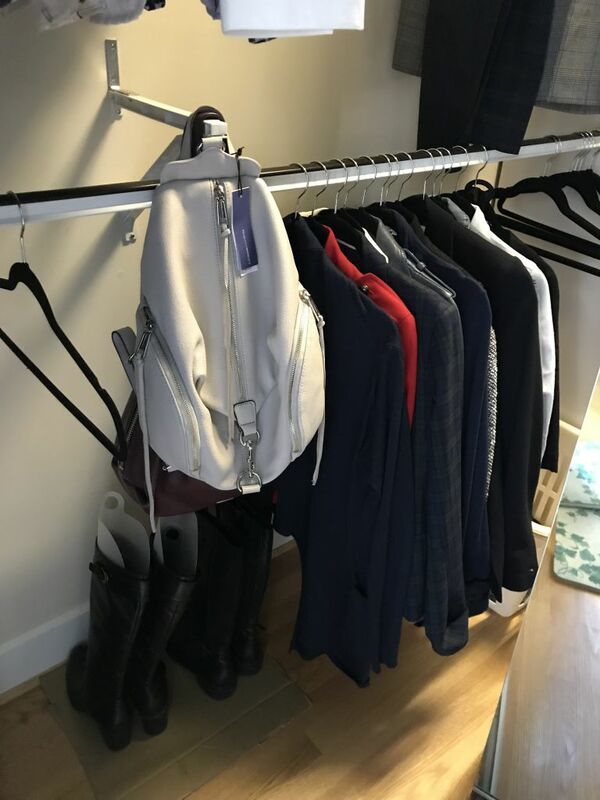 Hope to see more of your wardrobe in action as you settle in! Interesting! And you make it sound easy - which it probably wasn’t. Suz, you made this sound fun. When we moved, we moved ourselves and I got rid of boxes and boxes of stuff. My motivation for now doing a big closet edit is to have more a more spacious closet. 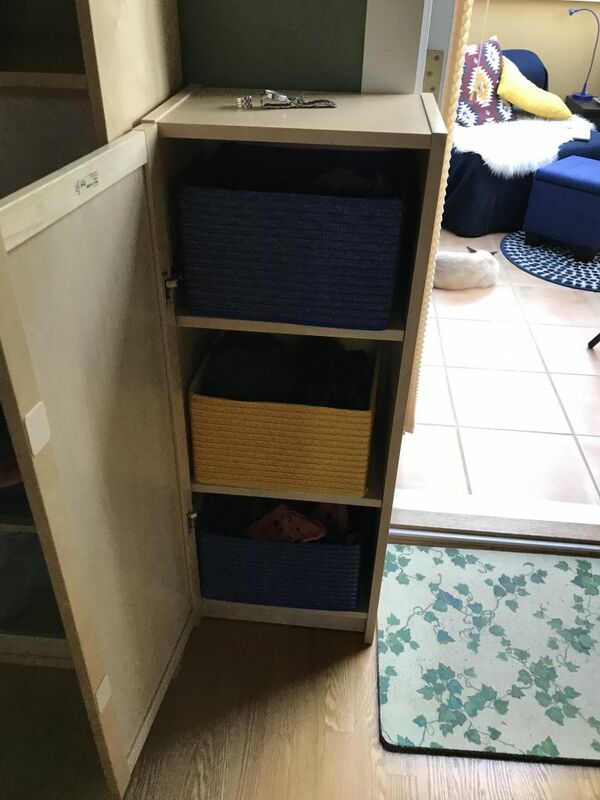 There is a big built in closet in our basement but I don't want to fill it with wardrobe overflow. There have been no regrets over anything I got rid of before moving. Your post was very motivational because I would love to be where you are. Most hesitation is because I really can't afford to replace a third of my wardrobe a year. Most of my essentials are possible mistakes. Tops that are too short, at least for low rise bottoms, items that feel too warm to layer or too cold for the season I want to wear them in. I no longer need a hot fall capsule but still find myself buying for it. This may be true of cold spring too, but I'm wearing these items earlier and enjoy the colors. Many many second hand items that may wear out faster than if new. You have done a beautiful job, both with your edit and explaining your thoughts. Very enlightening! It inspired me to look at my total # in and out over the past two years and it's sort of distressing - I need to shop less. Too many things that just never got worn. I think I'll keep that in mind while making some K/R decisions this week! I really like how thorough you have been. 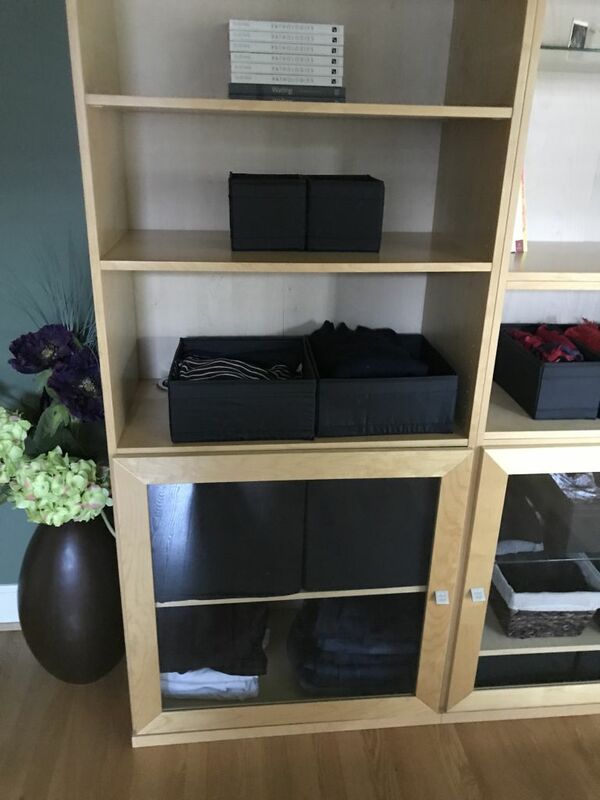 You easily had the room to keep these items, but it makes sense that your wardrobe will function better without them. Letting go of worn out items, as much as I am sad that they are worn out, there is a certain satisfaction that they served their purpose and got utilised, it was money well spent and I never have regrets saying goodbye. For me, the hard part is admitting the mistakes, so items that look great hanging up but just don't fit me or my lifestyle well. I need to get more ruthless in my editing. Thank you for this post, it is really helpful. Thanks for sharing!! Really interesting. And well done. cropped cardigan to wear to keep warm working at home or throw on over everything.. It looks fab with one pair of pants and one top( which I was wearing when I bought it) and pretty ordinary with eveything else... and it was pricey!! Thank you for your reply Suz,that’s very helpful. Brilliant post, so helpful to read your approach and results. 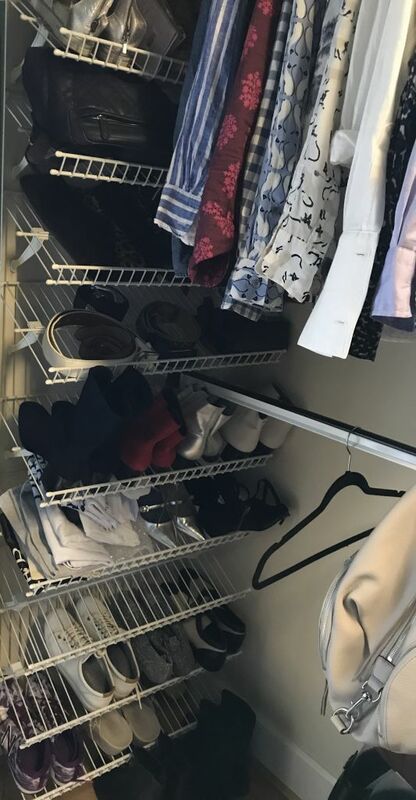 How wonderful to have a new huge closet!!! I love your "I have never regretted letting go of something".. You clearly don't let go of things without careful thought....but when you do it's TIME. On the other hand you have some orphans you keep, like the light colored booties, because you still loved them...and now you may get to wear them more in your new climate. This whole editing thing helps explain why your wardrobe is so cohesive and lovely. I don't think I've ever quite realized this until right now. Angie of course has told us this and is a master of same too. 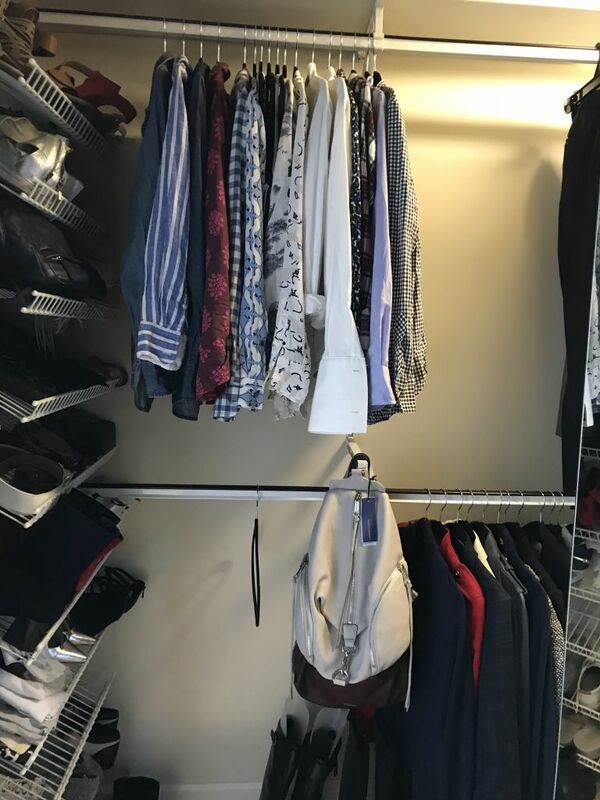 Isn't it nice to have a spacious closet? Thank you so much for taking the time to put down your thoughts and your process! It was very helpful to see your reasons for letting things go, and how long you had the items! Love this! Your post is very interesting, informative and useful, I will be re-reading it for further inspiration on organizing my wardrobe items. When it comes to core essentials, I've often worn the item out in 3 years (or less). But if the quality is really high, and the item has style longevity (like a blazer or a coat) I will keep such items for up to 10 years. Statement and dressy items get less wear as a rule...but again, may have longevity in the closet if the style is right. Knits have a shorter lifespan on the whole. I have in fact had some of my cashmere sweaters for 4 seasons or more...but they are beginning to look quite tired at this point. The "30 wears" threshold, as Jenn says, is more useful when you are making purchases than it is when it comes to editing. In other words, in deliberating the purchase you ask yourself, is there a good chance I'll want to wear this 30 times? When it comes to edits, it's a different matter. There's no way I will hang onto something simply because I haven't worn it 30 times. If I'm sick of it, or it didn't work out for some reason, or it doesn't fit, or it's worn out, it goes! "30 wears" can also be thought of as an average. Because I wear denim a lot, I easily get 100 or more wears from favourite jeans (unless they wear out before that, which a few pairs have). I figure this wear standard averages out with the dress or coat that I only wear 10 times in 5 years. In turn, this also tells me that it's worth it for me to spend on denim. (Current denim is important to my personal style; CPW is very low no matter what the initial outlay). It also reminds me that for certain trend items or infrequently worn items (e.g. an evening clutch, a very trendy bag or top) I should look first to inexpensive purveyers like Zara or BP. Or aim to buy on sale. This is my favorite closet edit post so far — much to inspire me, so thank you! Your analysis is really helpful. And...look at all that lovely empty space! I don’t have that even though our closet is a decent size. Suz, I’m intrigued by your comment about some things “coming into their own” in their second or even later season with you, because I’ve had the same experience several times. I’ve even planned to edit something out and only then started wearing and enjoying it a lot. I wonder why that is? And I also keep track of when things were purchased (thank you, Angie and YLF!) and find that information is extremely helpful for editing decisions. Windchime, I think there are a couple of reasons this can happen for me. Sometimes if it's a newer style I don't have the right support act for the item in the first season, try as I may to find it. Then all of a sudden I find the complements it needs and I start to wear it. Sometimes, the item is a "style stretcher" and it just makes me a bit uncomfortable at first -- I felt like that about my first pair of white jeans, for example, and I had to force myself to wear them the first few times... but now I wear them constantly! Sometimes the weather doesn't cooperate or expected occasions don't materialize so I just don't get as many opportunities as expected to wear it in the first year. Janet, I know, right? These closets are HUGE!! 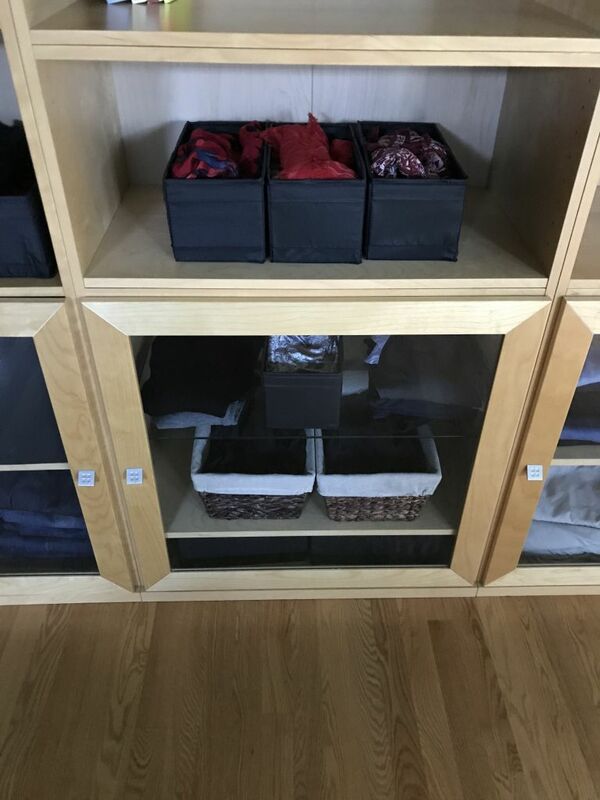 But weirdly, no drawers, and hardly any "full length" space for dresses, etc. I'm not complaining, though. A trip to Ikea solved those issues. I also have a TON of mirrors in this house! An entire wall in our bedroom, plus big bathroom mirrors, a mirror in the front entrance, and a big mirror in the hallway. I see myself coming and going. It's weird living with someone else's decor and "stuff" but also really interesting! I wanted to comment the exact thing like Windchime, and agree with all you answered her, Suz! This is fashion's magic indeed! Thanx for the post Suz, it's very inspiring! Great post and discussion here, Suz. Thank you for taking the time to write it out and to add further thoughts as the thread evolved. I am inspired by your tracking of how long things have been in your closet when you pass them along. I think that is very useful and I will aim to start doing that (will have to estimate for some things but I can start recording the dates of new purchases going forward). I think that a lot of my "not me/mistakes" tend to be essentials, too. I wonder if it's partly because we don't know precisely what we're looking for. For a statement piece, it's that heart-stopping effect -- if the love is there, I'm likely to wear a piece even if some detail is a little off. For essentials, the details have to be exactly right -- but it's harder to develop a sense of what those details are. And then, even when we know exactly what we're looking for in an essential, it can be hard to wait and not settle precisely because they are essentials! It's easier to live without a statement piece while waiting for the right one to show up. Thanks so much for this post, Suz. I'll likely be coming back to it when I'm prepping for my own move next year. I think culling 20-30% of your wardrobe per year makes absolute sense. If you expect items to last between 3 and 5 years, that's how the math works out. It was a big, eye-opening moment for me to realize that, in fact, clothes don't last forever, and you can plan for that. I'd expect the cull to be on the higher end when you're moving, too! I always feel like a move is a chance to critically evaluate all my possessions. Not that you can't do that without moving, but moving makes it more relevant. Jenn, yes -- I definitely erred on the side of "eject it" if I had doubts, prior to the move! Moving really is an opportunity to re-evaluate. 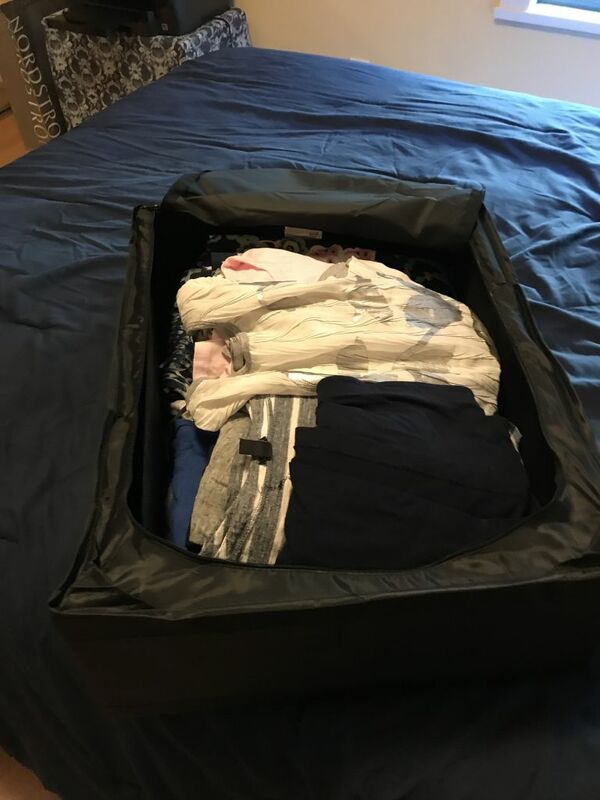 I'm grateful to you for both the "30 wear" guideline and also for your 3-5 years idea...when you mentioned it, I looked at my own closet and made estimates and realized, that yes, on the average, that is how long I want to own most items. Some things wear out faster (footwear for me, because I'm such a heavy user of it and it also is a style definer) but even there, I rarely have a shoe for less than 3 years unless I completely wore it out with daily wear (which happens...). If you edit regularly and want a current wardrobe, the 3-5 year standard is a really good one. Apart from occasion wear, most things will have had 30 wears by then, and if not, there's probably a good reason (and good reason to let them go). I forgot to add that your new closet looks great! I think I’d probably have quite a few more pairs of shoes if I had racks like those. Sorry if I have missed some info you might have given earlier, but I just wonder: Where have you moved to? The info in your profile says "Ontario, Canada," but wasn' that where you were moving from? This is awesome Suz, thank you for putting it together. Although my move is only from old front house into new back house it is from over-cluttered to hopefully streamlined! So many donations and I also sold some books to 2 second-hand booksellers- only made $135 all told but better than nothing! I have donated 33 items of clothing since March, and that is more than usual and still a struggle. It includes some holding zone/sentimental. Will refer back to your post.